The 2017-18 high school basketball season is headed down the home stretch. With most of Oregon's leagues at the halfway point of the season, every week and every game matters more and more the rest of the way. With all that as pretext, you just know that Pamplin Media Group's sports editors and photographers will be out in force to cover the action on Friday. • No. 16 Tigard (5-1 in TRL play, 9-6 overall) at No. 11 Lake Oswego (5-1 in TRL play, 11-5 overall), 7 p.m.
• No. 27 Sherwood (3-3 in TRL play, 10-6 overall) at No. 11 Tualatin (4-2 in TRL play, 12-4 overall), 7:15 p.m.
• No. 28 Barlow (4-2 in MHC play, 9-7 overall) at No. 17 Central Catholic (5-1 in MHC play, 10-6 overall), 6 p.m.
• No. 19 Beaverton (5-4 in Metro play, 9-8 overall) at No. 33 Sunset (5-4 in Metro play, 7-10 overall), 7:15 p.m.
• No. 19 St. Helens (3-3 in NWOC play, 9-7 overall) at No. 5 Wilsonville (6-0 in NWOC play, 10-6 overall), 7:15 p.m.
• No. 22 Putnam (3-3 in NWOC play, 4-12 overall) at No. 23 Sandy (2-4 in NWOC play, 5-11 overall), 7:15 p.m.
• No. 31 Corbett (0-3 in TVC play, 5-10 overall) at No. 28 Madras (2-1 in TVC play, 6-10 overall), 7 p.m.
• No. 1 Southridge (9-0 in Metro play, 16-1 overall) at No. 14 Glencoe (5-3 in Metro play, 10-5 overall), 7:15 p.m.
• No. 35 Lake Oswego (2-6 in TRL play, 5-11 overall) at No. 26 Tualatin (3-5 in TRL play, 7-9 overall), 5:45 p.m.
• No. 50 Reynolds (0-6 in MHC play, 1-15 overall) at No. 43 Centennial (3-3 in MHC play, 9-9 overall), 7:30 p.m.
• No. 16 Corvallis (1-4 in MWC play, 4-11 overall) at No. 32 Woodburn (0-5 in MWC play, 1-13 overall), 7 p.m.
• No. 31 Corbett (1-2 in TVC play, 4-11 overall) at No. 10 Madras (3-0 in TVC play, 14-2 overall), 5:30 p.m.
• No. 32 Gladstone (1-2 in TVC play, 5-12 overall) at No. 39 Crook County (0-3 in TVC play, 4-13 overall), 7 p.m.
Roosevelt at Madison, 7:15 p.m.
Wilson at Cleveland, 7:15 p.m.
Jefferson-Portland at Franklin, 7:15 p.m.
Aloha at Liberty, 7:15 p.m.
Westview at Century, 7:15 p.m.
Beaverton at Sunset, 7:15 p.m.
Glencoe at Southridge, 7:15 p.m.
Clackamas at David Douglas, 6 p.m.
Reynolds at Centennial, 6 p.m.
Central Catholic at Barlow, 6 p.m.
Oregon City at Gresham, 6 p.m.
Canby at Lakeridge, 7 p.m.
Tigard at Lake Oswego, 7 p.m.
Sherwood at Tualatin, 7:15 p.m.
Forest Grove at McKay, 7:15 p.m.
North Salem at South Salem, 7:15 p.m.
West Salem at McMinnville, 7:15 p.m.
Willamette at Grants Pass, 6:45 p.m.
South Medford at South Eugene, 6:45 p.m.
North Medford at Sheldon, 6:45 p.m.
Putnam at Sandy, 7:15 p.m.
Hillsboro at La Salle Prep, 7:15 p.m.
Silverton at Central, 7 p.m.
Woodburn at Corvallis, 7 p.m.
Lebanon at Crescent Valley, 7 p.m.
Dallas at South Albany, 7 p.m.
Springfield at North Eugene, 7 p.m.
Ashland at Marist Catholic, 7 p.m.
Churchill at Eagle Point, 7 p.m.
Redmond at Mountain View, 7 p.m.
Ridgeview at Summit, 7 p.m. The Dalles at Pendleton, 7 p.m.
Hermiston at Hood River Valley, 7 p.m.
Tillamook at Seaside, 6 p.m.
Scappoose at Valley Catholic, 6 p.m.
Banks at Astoria, 6 p.m.
Crook County at Gladstone, 7 p.m.
Estacada at Molalla, 7 p.m.
Corbett at Madras, 7 p.m.
Marshfield at Brookings-Harbor, 7:30 p.m.
Douglas at North Bend, 7:30 p.m.
South Umpqua at Siuslaw, 7:30 p.m.
Cascade at Philomath, 5:30 p.m.
Yamhill-Carlton at Newport, 5:30 p.m.
Stayton at North Marion, 5:30 p.m.
Phoenix at Klamath Union, 7:30 p.m.
North Valley at Hidden Valley, 7:30 p.m.
Ontario at La Grande, 7 p.m.
Warrenton at Catlin Gabel, 6 p.m.
Portland Christian at Oregon Episcopal, 6 p.m.
Riverdale at Rainier, 6 p.m.
Amity at Sheridan/Sheridan Japanese Char., 7:30 p.m.
Dayton at Taft, 7:30 p.m.
Santiam Christian at Willamina, 7:30 p.m. Horizon Christian-Tualatin at Westside Christian, 7:30 p.m.
Jefferson at Blanchet Catholic, 6 p.m.
Salem Acad. at Scio, 6 p.m.
Chemawa at Gervais, 6 p.m.
Creswell at La Pine, 6 p.m.
Harrisburg at Glide, 6 p.m.
Coquille at Pleasant Hill, 6 p.m.
Nyssa at Burns, 7:30 p.m.
Riverside at Umatilla, 7:30 p.m.
Illinois Valley at Lakeview, 7 p.m.
St. Mary's-Medford at Cascade Christian, 7 p.m.
East Linn Christian Acad. at Kennedy, 7 p.m.
Central Linn at St. Paul, 7 p.m.
Regis at Santiam, 7 p.m.
Bonanza at Oakland, 7:30 p.m.
Riddle at Monroe, 7:30 p.m.
Lost River at Oakridge, 7:30 p.m.
Butte Falls/Crater Lake Char. Acad. at Crow, 7:30 p.m.
Bandon at Myrtle Point, 7 p.m.
Toledo at Reedsport, 7 p.m.
Waldport at Gold Beach, 7 p.m.
Culver at Weston-McEwen, 6 p.m.
Stanfield at Pilot Rock, 6 p.m.
Imbler at Elgin, 7:30 p.m.
Enterprise at Grant Union, 7:30 p.m.
Canyonville Christian Acad. 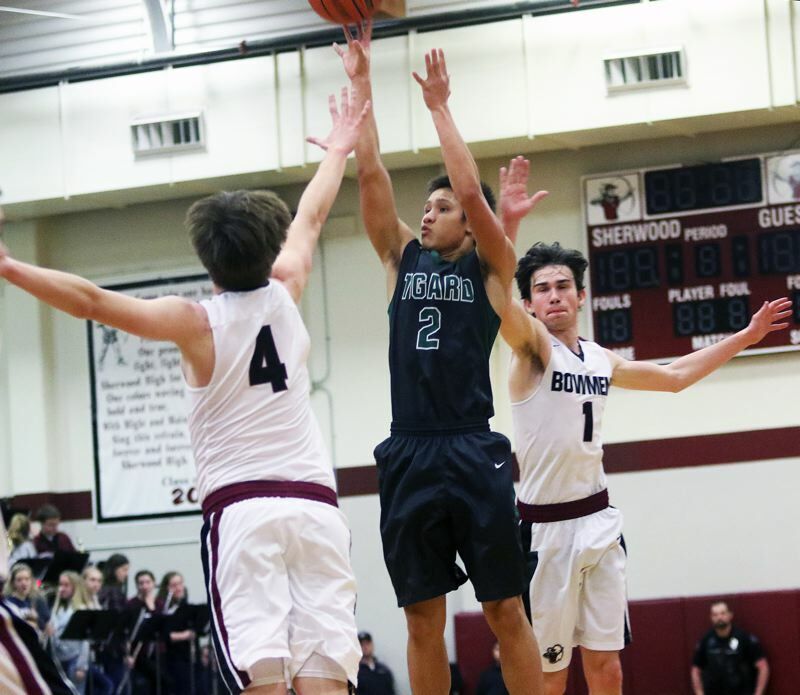 at Chiloquin, 7 p.m.
Valor Christian at Portland Waldorf, 6 p.m.
North Clackamas Christian at Southwest Christian, 7:30 p.m.
Country Christian at Open Door Christian Acad., 7:30 p.m.
St. Stephens Acad. at Damascus Christian, 7:30 p.m.
Crosshill Christian at Perrydale, 7 p.m.
Glendale at Pacific, 7:30 p.m.
North Douglas at Yoncalla, 7:30 p.m.
Elkton at Umpqua Valley Christian/Melrose Christian, 7:30 p.m.
Days Creek at Camas Valley, 7:30 p.m. Powers at New Hope Christian, 7:30 p.m.
Triad at Gilchrist, 5:30 p.m.
Trinity Lutheran at North Lake, 5:30 p.m.
Hosanna Christian at Prospect Char., 7 p.m.
Condon/Wheeler at South Wasco County, 7:30 p.m.
Sherman at Mitchell/Spray, 7:30 p.m.
Ione at Arlington, 7:30 p.m. Horizon Christian-Hood River at Dufur, 7:30 p.m.
Pine Eagle at Echo, 7 p.m.
Wallowa at Griswold, 7 p.m.
Powder Valley at Joseph, 7:30 p.m.
Nixyaawii at Cove, 7:30 p.m.
Huntington at Monument/Dayville, 7:30 p.m.
Harper Char. at Crane, 7:30 p.m.
Four Rivers Community School (JV) at Burnt River, 7:30 p.m.
TBD at Livingstone Adventist Acad., 7 p.m.
Oregon School F/T Deaf at Washington School F/T Deaf (Wa), 4 p.m.
Madison at Roosevelt, 7:15 p.m.
Cleveland at Wilson, 7:15 p.m.
Franklin at Jefferson-Portland, 7:15 p.m.
Liberty at Aloha, 7:15 p.m.
Sunset at Beaverton, 7:15 p.m.
Southridge at Glencoe, 7:15 p.m.
Century at Westview, 7:15 p.m.
Reynolds at Centennial, 7:30 p.m.
Central Catholic at Barlow, 7:30 p.m.
Clackamas at David Douglas, 7:30 p.m.
Oregon City at Gresham, 7:30 p.m.
Lakeridge at Tigard, 7 p.m.
South Eugene at South Medford, 6:45 p.m.
Sheldon at North Medford, 6:45 p.m. Grants Pass at Willamette, 6:45 p.m.
Hillsboro at La Salle Prep, 5:30 p.m.
Sandy at Putnam, 7:15 p.m.
Silverton at Central, 5:30 p.m.
Corvallis at Woodburn, 7 p.m.
Crescent Valley at Lebanon, 7 p.m.
South Albany at Dallas, 7 p.m.
Ashland at Marist Catholic, 5:30 p.m.
North Eugene at Springfield, 7 p.m.
Eagle Point at Churchill, 7 p.m.
Mountain View at Redmond, 7 p.m. Summit at Ridgeview, 7 p.m. Hood River Valley at Hermiston, 7 p.m.
Pendleton at The Dalles, 7 p.m.
Banks at Astoria, 7:30 p.m.
Scappoose at Valley Catholic, 7:30 p.m.
Tillamook at Seaside, 7:30 p.m.
Corbett at Madras, 5:30 p.m.
Molalla at Estacada, 7 p.m.
Marshfield at Brookings-Harbor, 6 p.m.
Douglas at North Bend, 6 p.m.
South Umpqua at Siuslaw, 6 p.m.
Stayton at North Marion, 7 p.m.
Yamhill-Carlton at Newport, 7 p.m.
Sisters at Sutherlin, 7:15 p.m.
Sweet Home at Junction City, 7:15 p.m.
North Valley at Hidden Valley, 6 p.m.
Phoenix at Klamath Union, 6 p.m.
Riverdale at Rainier, 7:30 p.m.
Portland Christian at Oregon Episcopal, 7:30 p.m.
Warrenton at Catlin Gabel, 7:30 p.m.
Sheridan/Sheridan Japanese Char. at Amity, 6 p.m.
Santiam Christian at Willamina, 6 p.m.
Dayton at Taft, 6 p.m.
Chemawa at Gervais, 7:30 p.m.
Jefferson at Blanchet Catholic, 7:30 p.m.
Salem Acad. at Scio, 7:30 p.m.
Harrisburg at Glide, 7 p.m.
Creswell at La Pine, 7:30 p.m.
Coquille at Pleasant Hill, 7:30 p.m.
Nyssa at Burns, 6 p.m.
Riverside at Umatilla, 6 p.m.
St. Mary's-Medford at Cascade Christian, 5:30 p.m.
Illinois Valley at Lakeview, 5:30 p.m.
Central Linn at St. Paul, 5:30 p.m.
East Linn Christian Acad. at Kennedy, 5:30 p.m.
Regis at Santiam, 5:30 p.m.
Bonanza at Oakland, 6 p.m.
Lost River at Oakridge, 6 p.m.
Butte Falls/Crater Lake Char. Acad. at Crow, 6 p.m.
Riddle at Monroe, 7 p.m.
Waldport at Gold Beach, 5:30 p.m.
Bandon at Myrtle Point, 5:30 p.m.
Toledo at Reedsport, 5:30 p.m.
Stanfield at Pilot Rock, 7:30 p.m.
Culver at Weston-McEwen, 7:30 p.m.
Imbler at Elgin, 6 p.m.
Enterprise at Grant Union, 6 p.m.
Canyonville Christian Acad. at Chiloquin, 5:30 p.m.
North Clackamas Christian at Southwest Christian, 6 p.m.
St. Stephens Acad. at Damascus Christian, 6 p.m.
Crosshill Christian at Perrydale, 5:30 p.m.
Glendale at Pacific, 6 p.m.
Elkton at Umpqua Valley Christian/Melrose Christian, 6 p.m.
Days Creek at Camas Valley, 6 p.m.
North Douglas at Yoncalla, 6 p.m. Powers at New Hope Christian, 6 p.m.
Triad at Gilchrist, 4 p.m.
Paisley at Central Christian, 5 p.m.
Hosanna Christian at Prospect Char., 5:30 p.m.
Condon/Wheeler at South Wasco County, 6 p.m.
Sherman at Mitchell/Spray, 6 p.m. Horizon Christian-Hood River at Dufur, 6 p.m.
Ione at Arlington, 6 p.m.
Wallowa at Griswold, 3 p.m.
Pine Eagle at Echo, 5:30 p.m.
Powder Valley at Joseph, 6 p.m.
Nixyaawii at Cove, 6 p.m.
Jordan Valley at Prairie City, 5 p.m.
Huntington at Monument/Dayville, 6 p.m.
Harper Char. at Crane, 6 p.m.
Four Rivers Community School (JV) at Burnt River, 6 p.m.
Oregon School F/T Deaf at Washington School F/T Deaf, 2:30 p.m.